Pardon my French, but the new media revolution that came hand in hand with the Internet has kind of kicked old media straight in the balls. The number of fascinating, funny, creative, and charming web-series that have been popping up over the past few years has been downright staggering. I figure it’s a phenomenon that’s fairly similar to the independent gaming: the Internet gives people with ideas too strange or too abnormal the opportunity to realize and share their concept. It gives people without the means – or desire – to contact a producer the ability to self-distribute their stuff. Basically, it’s the best thing to happen to media since the television was invented. I’ve not even gotten to the best part about the web-TV craze: the majority of the shows out there seem like they’re custom-tailored to geeks. 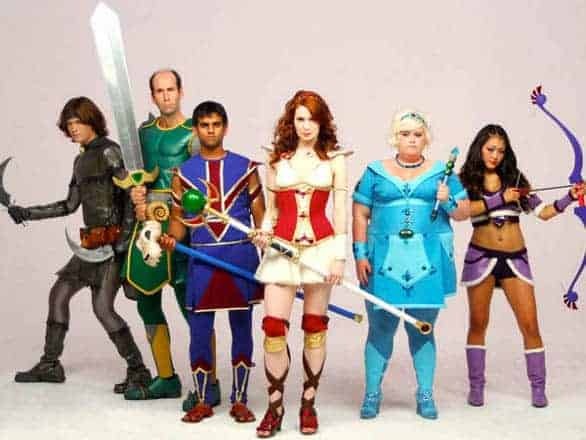 Now, naturally; when someone mentions a geeky web-series, the first show anyone will automatically default to is The Guild. Honestly, though? That’s just the tip of the iceberg. There’s so much more to be found online – so many more great web-series that are bound to hook you in if you just give them a chance. Submitted for your viewing pleasure; here’s a list of a few of my personal favorites. Not every vault dweller that wanders out into the wasteland is a hero; not every vault wanderer is destined to change the world for the better. Nuka Break follows the unlikely band of Twig, Scarlet, and Ben; and Twig’s quest for the perfect bottle of Nuka Cola. Scarlet, a former slave; and Ben, a ghoul, are sort of just along for the ride. Originally conceptualized as a fan-series, Nuka Break caught on to such a degree that they decided to turn it into a full-on series. It’s hilarious, and watching the series makes it rather clear that the people who made it are very, very big fans of the Fallout universe. Watch it here. Set in the mystical land of Nudonia, Doraleous and Associates is an animated series which follows the exploits of the titular character and…well, his associates. It’s basically a parody of every D&D game every run, every fantasy novel ever written, every magical medieval setting ever devised. Unfortunately, the series is on indefinite hiatus while the team behind it readies themselves for a feature-film, but you can still find it all on YouTube(where they’re re-releasing the series on a weekly basis). What if professional gamers were mainstream celebrities, right up there with movie stars and famous athletes? What if there were special, elite schools; designed for the best and brightest in the gaming scene? That’s the premise of Video Game High School. Set in the near future; competitive gaming has become the world’s most popular spectator sport, and pro gamers are superstars. One such gamer is a rather abrasive fellow nicknamed “The Law.” Unfortunately for him, he crosses paths with Brian – an ordinary high school student and star of the series – while trolling random servers on a talk show, and is completely humiliated on national television. Brian is invited to attend the Video Game High School – a legendary institution for elite gamers- and The Law, like any rational, well-balanced adult; decides that he needs to humiliate the one gamer who defeated him: he also enrolls. You can watch VGHS here. The best analogy I can come up with to describe There Will Be Brawl is to have you imagine if someone took The Sopranos and Silence of the Lambs, mashed the two together into one entity, then made that entity have a child with Super Smash Brothers. Yeah, I’m aware it sounds pretty weird – and a little stupid, I suppose – but bear with me: it’s actually a bloody fantastic show, and the acting’s actually not half bad. If you’re looking for a dose of drama – and found yourself a fan of any of the two shows mentioned here- watch it. Dragon Age: Redemption follows the story of Tallis (Felicia Day); an Elven assassin conscripted to bring down a dangerous rogue Qunari mage. Production values are obscenely high – particularly since the series has the support of Bioware – and even though it’s only split into six parts at the moment (a second season might be coming); it’s inarguably still worth watching. View it here.